Market update Fox Valley-January 26 2019. 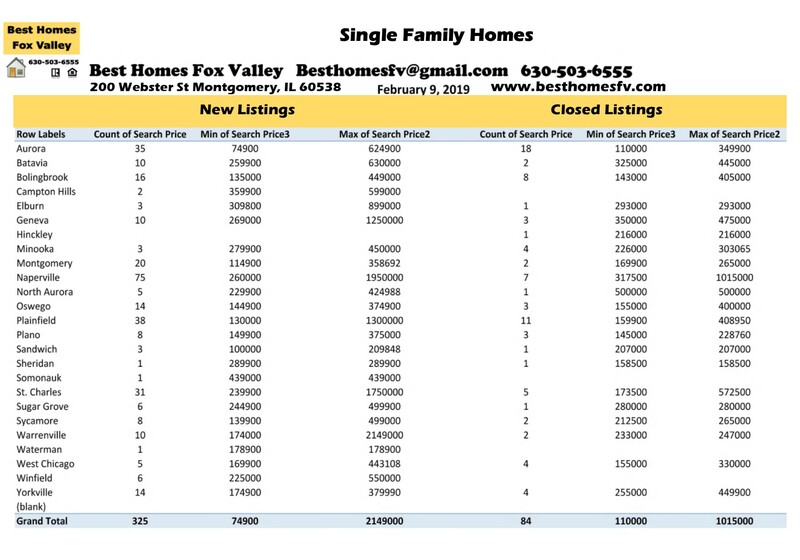 New listings were not far off of the number last week. 209 new listings this week compared to 224 last week. That is not too bad for the weather we are having. It was a real mild winter up until this week. We are really going to hit the low temperatures next week. Closed listings were another story. 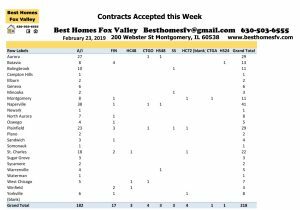 They were way down when they should be going up with the end of the month but the holidays contributed to these low numbers. 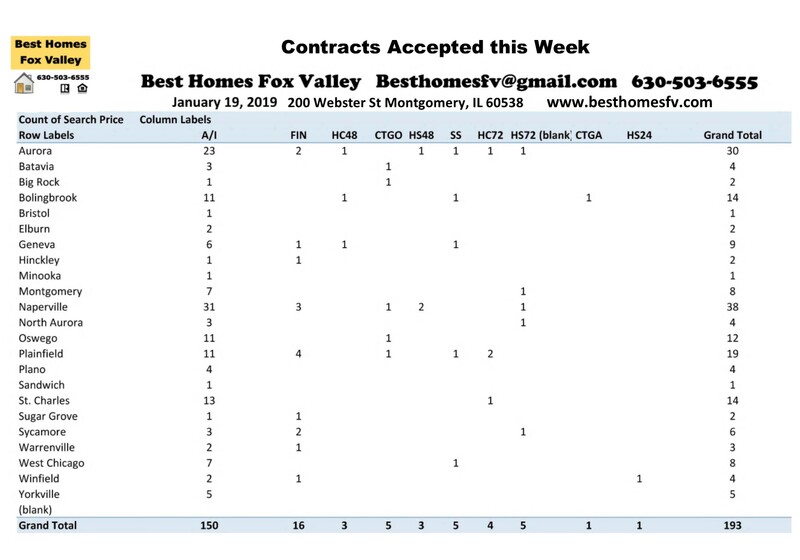 82 closed homes this week compared to 115 last week. 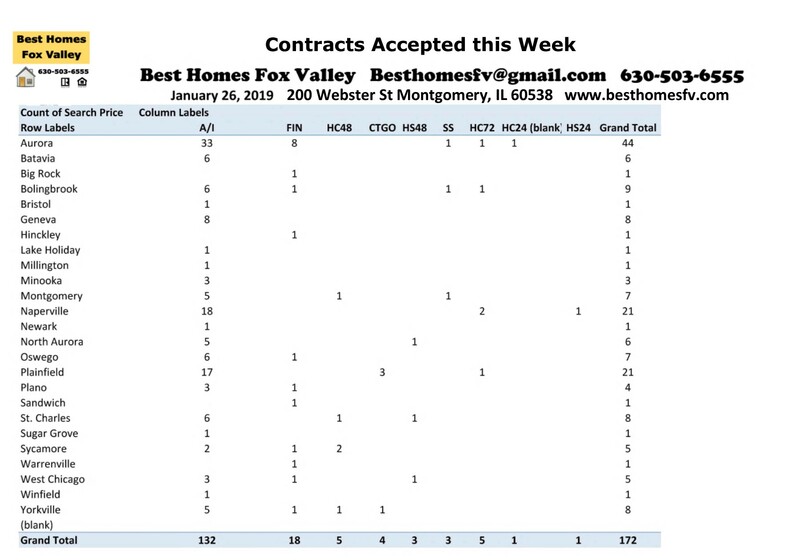 There is 4 business days next week for the end of the month so we should see higher numbers next week. 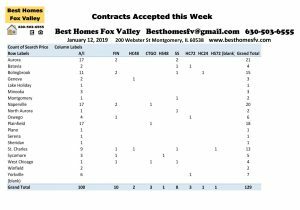 Contracts accepted this week were down slightly. 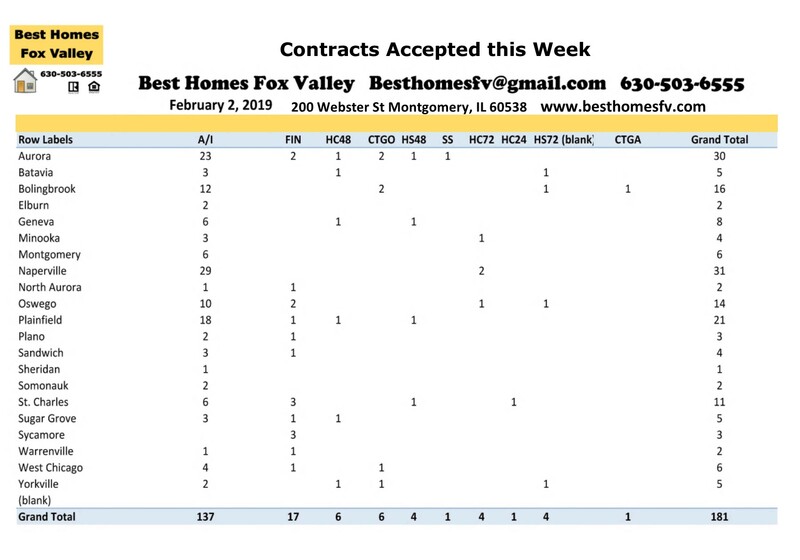 172 accepted contracts this week compared to 193 last week. Not too bad with the weather we have been having. 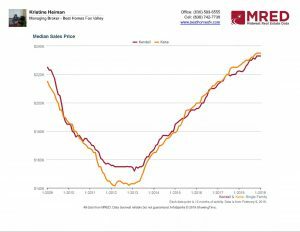 People are still ready to get out there and look. It sure helps when Sellers take photos to show what the deck, patio and yard look like without the snow. 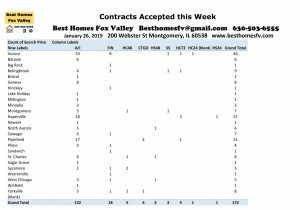 Short sales accepted this week were similar to last week. 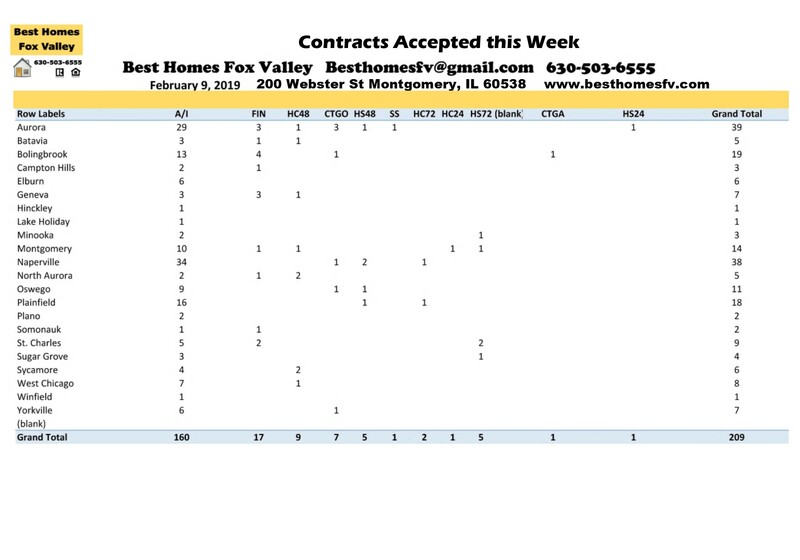 5 short sales accepted by Sellers this week compared to 5 last week. 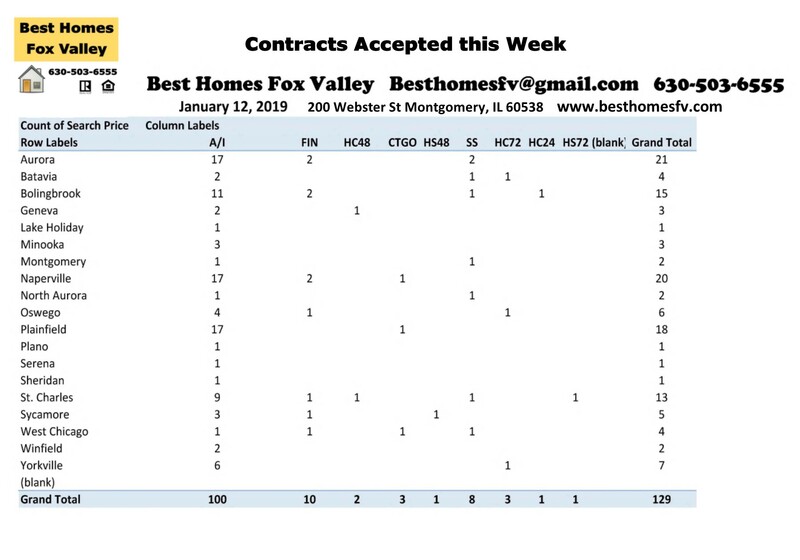 1 each in Aurora, Bolingbrook and Montgomery. Now they will be submitted to the lender to see if they will also accept as written. Sellers accepted contracts this week that are contingent on the closing of the Buyers current property before purchasing. 5 that have a kick-out clause of 72 hours, 5 with 48 hours and 1 with 24 hours. 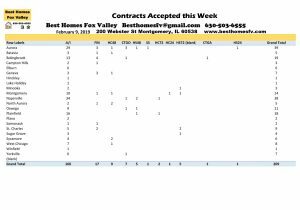 Contracts were also accepted by sellers that are contingent on the Buyers selling and closing on their current home. 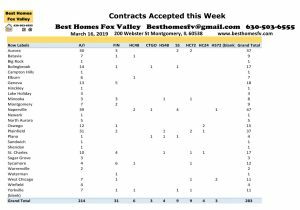 3 with a kick-out clause of 48 hours and 1 with 24 hours. Call us at 630-503-6555 Jeffery Szymczak-Broker ext 104, Bobby Burson-Broker ext 105 or Kristine Heiman-Managing Broker ext 101. 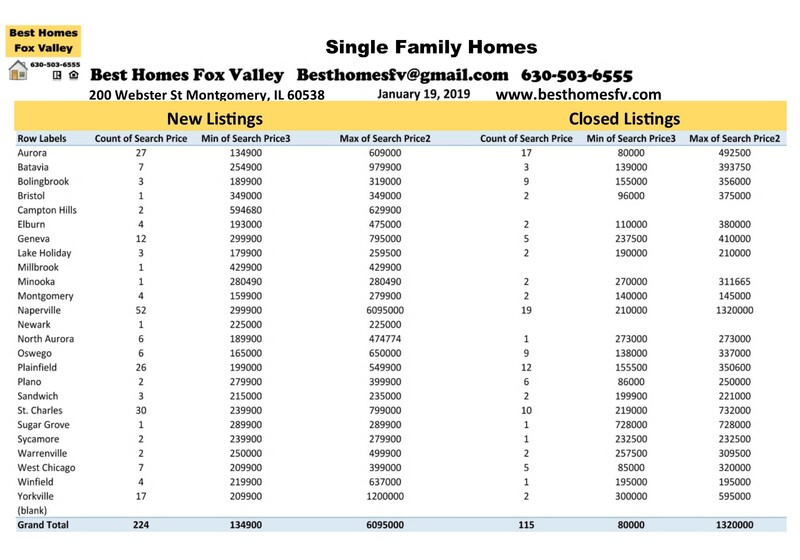 We will answer the real estate questions that you have. 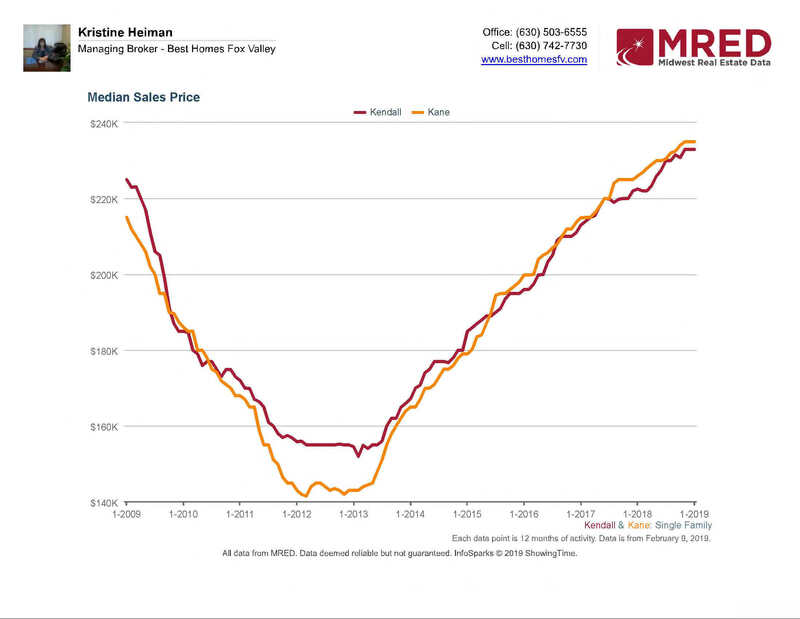 Our goal is to negotiate price and terms that are best whether buying or selling a home. 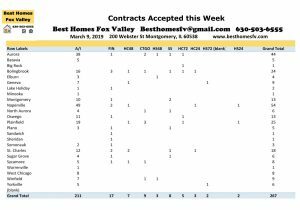 We make it our business to find the perfect fit for your needs. Spring market is just around the corner. If your home is market ready now might be the best time before you have too much competition. 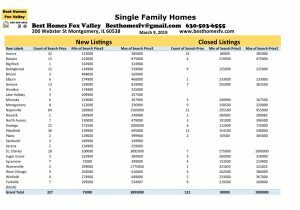 Let us update the value of your home in today’s market. We will provide you with a net proceeds so you know the expenses to sell. This will be updated when an offer comes in and we know all the terms. If you are thinking about buying a home your fist step is to get pre-qualified with a lender so you know what type of loan and what price range works out best for you. They will provide you with a letter that will go with an offer when you find your home that shows the seller you qualify for their home so they will be comfortable accepting your offer. 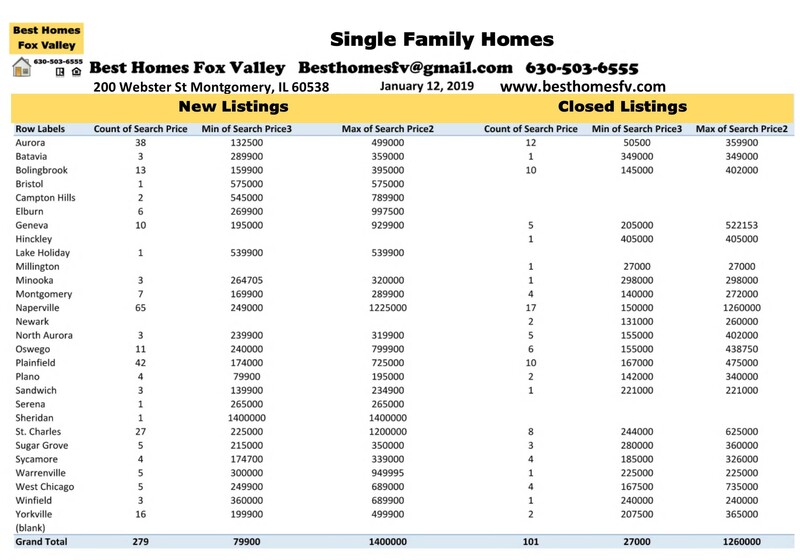 Market Update Fox Valley-January 26 2019. Have a great week!